Have commercials about back-to-school sales ruffled your feathers yet? They bothered me when I was still a student, but Halloween products couldn't arrive in stores early enough! I have no shame about blogging about costume options already. Branch out to Life is the Bubbles, Beadmask, Purple Peacock Jewels and Athenianaire for bird jewelry and costume accessories. 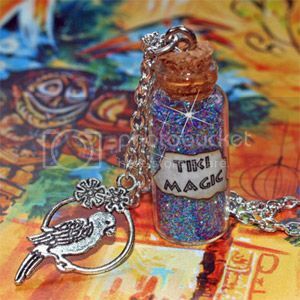 Life is the Bubbles' Tiki magic bottle necklace will transport your mind to a tropical paradise where the "birds sing words, and the flowers croon." The fun piece of jewelry is inspired by the Enchanted Tiki Room, one of the oldest attractions in Disneyland. The bottle is securely corked so the colorful glitter doesn't hula away. A bird charm swings along to its cheery song. The pendant hangs on a 19.5" chain that closes with a heart toggle clasp. 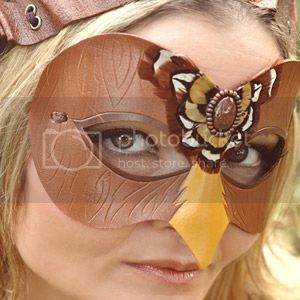 Beadmask's masquerade bird mask will make you stand out from the flock at the next costume party! The handcrafted leather mask is painted in warm brown and gold tones. The design features a faux wood grain background with an intricate feather medallion at the forehead. At the center of the featherwork is a gorgeous red jasper cabochon, set in a single row of glass seed beads. The mask measures approximately 5" high by 7.75" wide and ties with a durable stretch ribbon. Purple Peacock Jewels' feather hair fascinator will make you feel as pretty as a peacock, whether you wear it with a belly dance costume or a date night outfit! 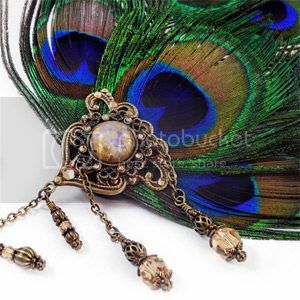 Six peacock feathers are held together by an antique brass ornament, adorned with a fire opal and matching Swarovski rhinestones. An embellished bobby pin is connected by an antique brass chain with seven beaded dangles. The steampunk headdress is backed with sturdy black felt and a double-pronged alligator clip to perch securely upon your head. 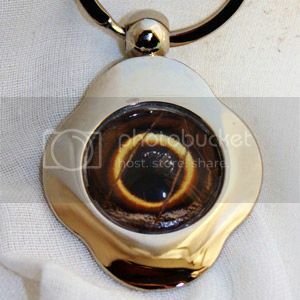 Athenianaire's owl butterfly key chain will keep an eye on your keys! Isn't it a hoot how nature's design on a real butterfly wing resembles an owl's eye? The eyespot specimen has been preserved in a 1" in diameter glass cab. The rhodium silver coated key chain may attract evil eye jewelry fans, but it's crafted for a good cause. 100% of the sale benefits the Moth and Butterfly Rearing Project. that necklace is really cool. I really love the birds and I'm a sucker for fantasy.